It’s that time of year again and the festive season is around the corner. Many people choose to travel for the Christmas holidays whether it be to visit friends and family or to spend time celebrating in a new and exciting country. However, lots of us choose not to travel and experience the festivities here in Dubai. There are so many options here to celebrate with our loved ones. There are an array of Christmas markets with beautifully decorated Christmas trees, food, rides and games, arts and crafts and even a chance for your little ones to meet Santa himself in his grotto! These all provide opportunities for you and your family to get into the Christmas spirit. If you’re missing the snow at this time of year, you can always find it here in Dubai. 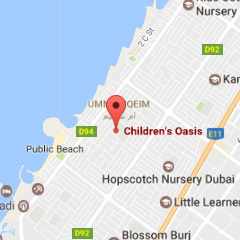 Why not visit Ski Dubai at the Mall of Emirates, or go ice skating in Dubai Mall, where you and your children can wrap up and experience cold temperatures and play in the snow. Getting your children involved in the Christmas preparation at home can be lots of fun. They can help you decorate the Christmas tree, make little Christmas treats, decorate cookies and even make Christmas decorations of their own. One of our simple but favourite activities here at Children’s Oasis is making magical reindeer food to sprinkle outside on the lawn (if you have one) on Christmas Eve. This is simply raw porridge oats mixed with glitter and put into a little bag ready to sprinkle for Rudolph and his friends! Planning Christmas Day can be stressful. There’s all the shopping to be done, presents to wrap and of course, all the delicious food to be prepared. However, there are so many options here in Dubai to make it that little bit easier for you. 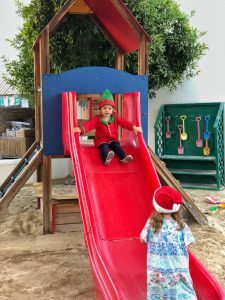 There are countless choices for Christmas brunches in hotels and restaurants, many that provide activities for children to keep them entertained while you tuck into your meal. If you decide to spend Christmas Day at home, many hotels and restaurants deliver a cooked Christmas meal so you don’t have to lift a finger in the kitchen! This can provide you with valuable extra time to organise the rest of your day. As we are lucky enough to live in such warm climates here in Dubai, going down to the beach for Christmas can be a fun option too. Your little ones can get out their buckets and spades and have lots of fun building a ‘sandman’. Of course, as we know Dubai is such a multicultural city and Christmas can be celebrated in lots of different ways. Children are so excited to receive their presents on Christmas Day, however it’s important to remind them of how fortunate they are and doing something kind for others will make Santa very happy too. However you decide to celebrate… Happy holidays!